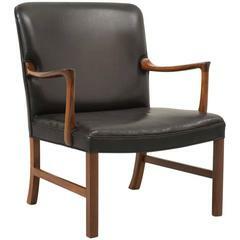 Ole Wanscher design "Colonial" armchair for Paul Jeppsen, Denmark. Made with a solid rosewood frame and cane seat with chocolate brown leather cushions, labeled. Matched original pair of Ole Wanscher "Colonial" armchairs for Paul Jeppsen, Denmark. Rare and sculptural design armchair designed by Nanna Ditzel model #114 for Kolds Savvaerk, Denmark. In very good original condition with black leatherette. 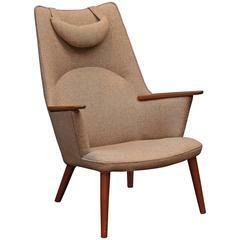 Super comfortable and sculptural armchair designed by Hans Wegner model AP 27, Denmark. Teak arm pads and legs, stamped with makers mark. 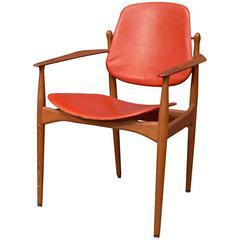 Arne Vodder design armchair model 184 for France & Daverksen, Denmark. Very good original condition desk or pull up chair with original orange leather, labeled and tagged. Produced by master cabinetmaker A.J. Iversen. 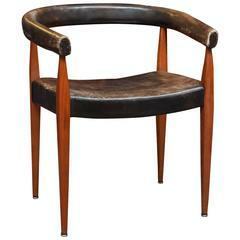 Beautifully figured Brazilian rosewood frame with aniline cognac leather seat. 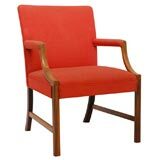 Set of two very comfortable armchairs designed by Ole Wanscher in the 1950s for A.J.Iversen Denmark. Wooden frame with black leather seating. 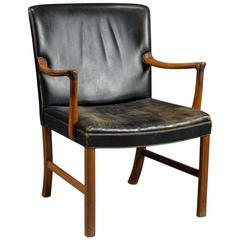 Rare model Ole Wanscher rosewood armchair for A. J. Iversen. Regal lines with pristine vintage black leather, Denmark, 1960s. 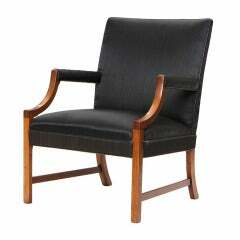 Ole Wanscher pair of armchairs in Rosewood and black horsehair. Executed by A. J. Iversen, Copenhagen, Denmark.